I haven't posted recipes in a while, but that's just because the laziness kicked in, not because we haven't been cooking recently. We've actually had quite a few delicious veggie side dishes in the last few weeks, and while I was going to do a round-up of three in one post, I've changed my mind and will drag out the excitement for you for three days instead. 1) Preheat the oven to 400°F. 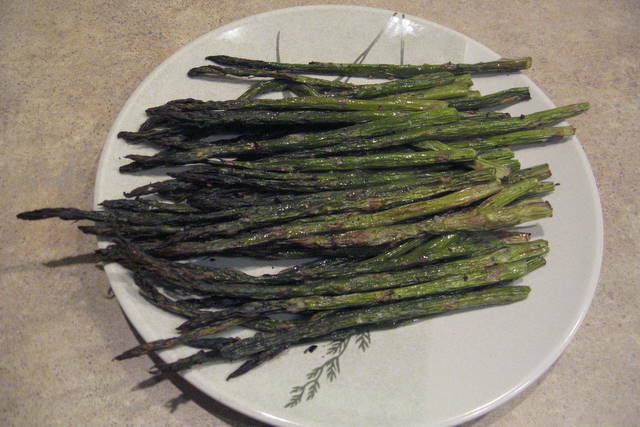 Wash the asparagus, cut off the bottom inch or so of each stalk, and dump the stalks into a plastic bag. 2)Add a tablespoon of olive, close the bag, and shake it to evenly distribute the oil on all the stalks. 3) Lay the asparagus out on a foil-covered cookie sheet, and sprinkle liberally with kosher salt and freshly ground black pepper. 4) Bake for at least 25 minutes to get the asparagus tips crunchy. I actually made one batch where I baked for 40 minutes (to time it with the rest of dinner) and the asparagus only got more crispy and delicious. now all it needs is ***forcefield sauce*** to be extra awesome. I feel like I'm missing a joke that I should be getting. Forcefield sauce? Yes, forcefield sauce makes this much better. Something like two tbsp butter, one tbsp balsamic vinegar, one tbsp soy sauce. Those ratios could be off but I think it'll do.